This semester has seen the first work on the payload and recovery system. There was a design team that worked on a recovery system for this project as a senior project; however, as the system has developed the original design is somewhat dated. The main stipulation for this system is that it needs to be able to return our data that will be taken during flight successfully back to the ground undamaged. To do this, we are looking at using two different chutes. 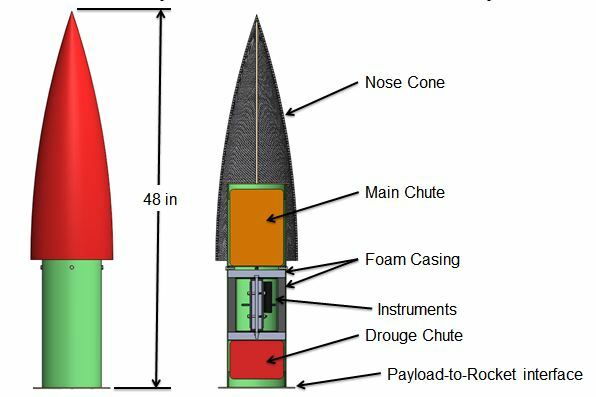 First, once the rocket has reached its maximum altitude (determined by an altimeter) the drogue chute will deploy using an ejection charge. Then, at a predetermined altitude, the altimeter will trigger the second charge, ejecting the main chute which will reduce the payload’s speed to about 10 ft/s until it lands. Overview of the payload system. Within the next few weeks depending on the schedule for STF 5, we will be testing and calibrating the ejection charges so that is enough to break the connection while not damaging the chutes.